Exclusivity of traditional art forms associated with Poland allows them to be differentiated instantly as seen with this hand painted ceramic.7L Stoneware Pitcher. Handcrafted Stoneware from Poland is made from the famous “white firing” clay, indigenous to the region. The clay properties allow the craftsman to develop exceptionally durable stoneware pitchers for use in the microwave, dishwasher and refrigerator. Use this pitcher to pour sausage gravy, syrups, salad dressing and later as a vase for wild flower arrangements. Featuring a non-porous surface that comes from the patented formula top glaze insure the bright glossy finish for the pitchers lifetime and protects the UNIKAT design, BLUE TULIP. The delicate, blue tulip and crocus motif is accented with gold and green highlights in a bouquet style. The floral motif is framed with a cobalt blue rim that makes the design pop on any table or counter top. The highly decorated design is from the UNIKAT collection and is more limited in production and more exclusive. The pitcher has been lovingly signed by the Master Artisan who painted it and stamped with the work UNIKAT which is Polish for unique. This pitcher is a one of a kind addition to a beautiful table top. A national treasure, Boleslawiec ceramics have been manufactured for centuries. Developed from natural ceramic clay that can be found near Boleslawiec at the Bobr and Kwisa rivers. According to historical sources, the first stoneware was made in medieval times and in the early 16th century, local potters formed guilds to ensure perfection. Zaklady Ceramiczne "BOLESLAWIEC" was founded by one of the original men with the first pattern dating back to 1759. “BLUE TULIP .7L Cylinder Pitcher“ is a UNIKAT pattern based of the 300 year old pattern "EYE OF THE PEACOCK". 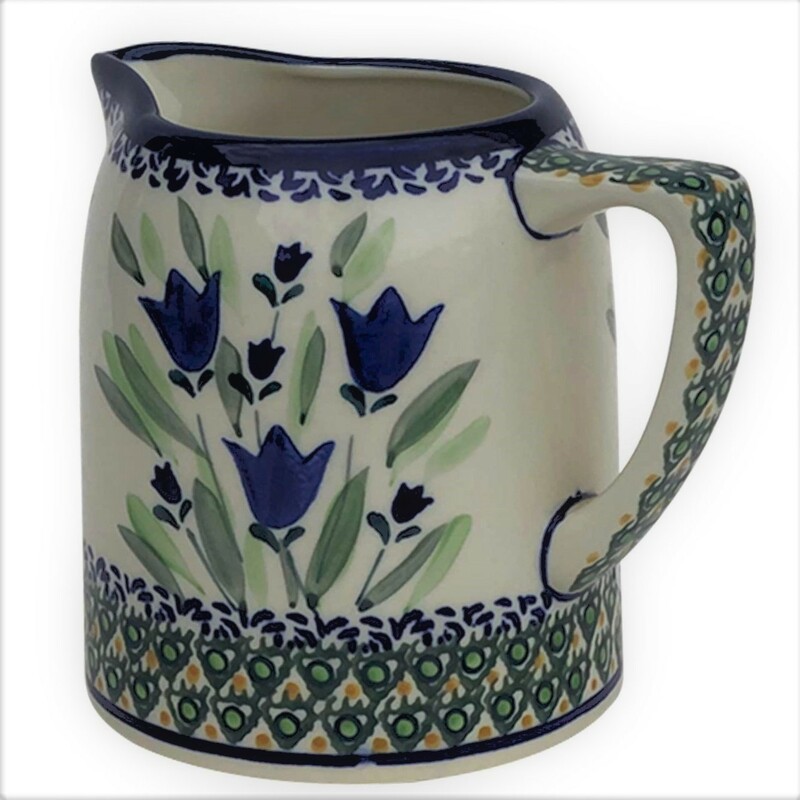 Designed by top designer and imported by Pottery Avenue, the premier importer of Polish Pottery & Polish Stoneware.